Once upon a time in the early eighties, when Nintendo was trying to break into the US gaming market, one of their games called Radar Scope which had been quite successful in Japan was shipped in large quantities across the pond. Upon arriving it didn't sell. In order to move the unsold inventory, one of Nintendo's designers was tasked with converting the excess machines into something that would appeal to an American audience. In order to do this, the designer wanted to create a game based on Popeye the Sailor, in which Bluto kidnapps Olive and Popeye has to save her. The licensing deal with the Popeye character's owner: King Features Syndicate, did however not work out at the time, so the designer had to change the concept. Instead Popeye became a jumping, hammer-wielding carpenter in blue and red overalls called "Jumpman", Bluto was changed into a gorilla named "Kong" and Olive became a generic damsel in distress, originally just referred to as "Lady". The object of the game is to climb to the top of the screen to save the girl, whilst avoiding or jumping over stuff that can hurt you and collecting objects along the way for points. When the new game arrived at the offices of Nintendo's newly established American division, the head sales manager hated it because there was no shooting in it. That game was Donkey Kong, soon to be Nintendo's best selling game for the next few years, and the game that put Nintendo on the map outside Japan. Donkey Kong was one of the first platform games and definitely the one that popularized the genre. The designer was Shigeru Miyamoto, whom in the following years would mastermind some of the world's most celebrated video-games to this day. The team responsible for Donkey Kong's English promotional material named the playable character "Mario", supposedly after the landlord who rented them their office space (according to the book: Game Over, By David Sheff), and thus the legendary career of Mario began. 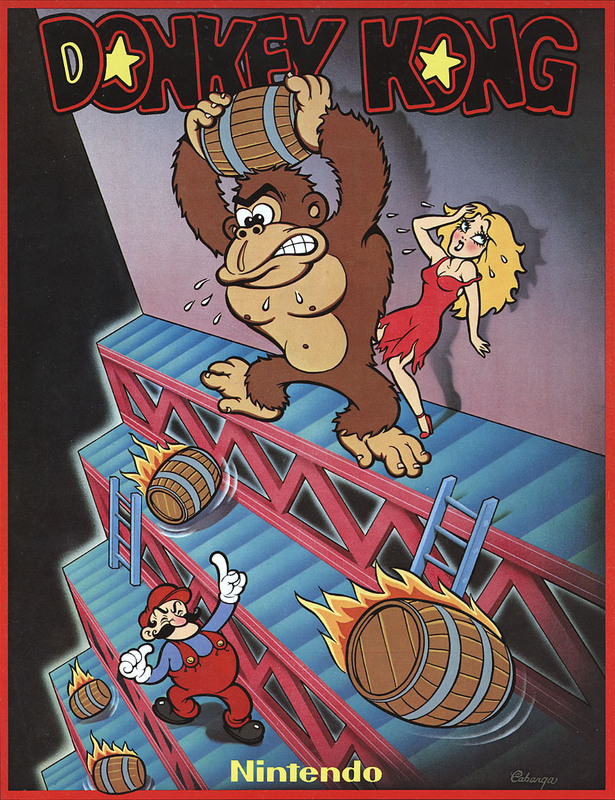 Donkey Kong was followed up the next year with Donkey Kong Jr. in which Kong's son has to save his father from Mario, this time cast as the villain. The game made several interesting improvements to the platforming of its predecessor and both games are fun to play. In 1983 Donkey Kong 3 came out. The third game has shooting in it, very little actual platforming and is really quite forgettable. Mario is not in this game. Instead a new character: "Stanley", a gardener who chases Kong around with a canister of bug-spray takes the place of the protagonist. Mario did however turn up in his own game that same year. This time together with his brother in Mario Bros.
Mario Bros is the game that cemented the image of the jumping and bopping Mario that we know from all the games that would follow in the franchise. It introduced his trusted brother and sidekick: "Luigi" as a simultaneously playable character, and it was also the game where he became a plumber. 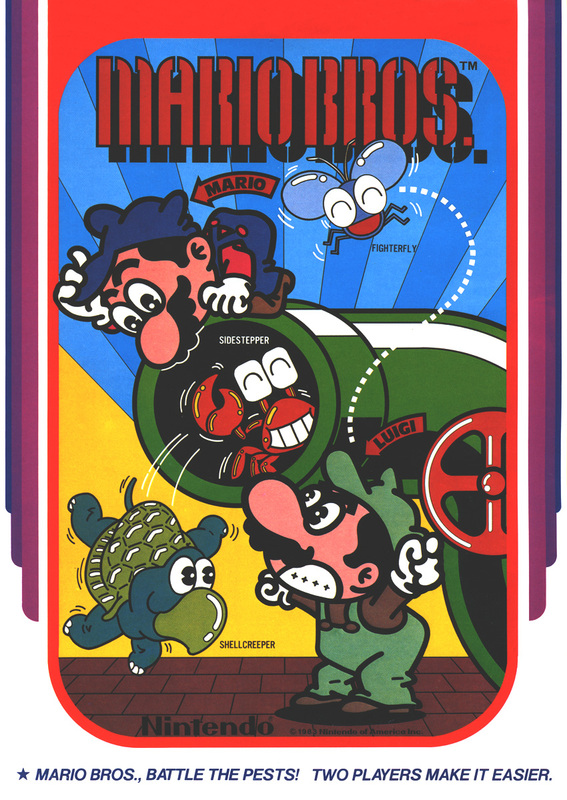 The object of Mario Bros is to clear critters off the pipes in a sewer. This is done by jumping up beneath them, thus flipping them on their backs and then kicking them away. PS: The courtroom drama was probably quite mild compared to the one that would eventually play out in the battle to be the world record score holder for Donkey Kong as chronicled in the documentary: The King of Kong: A Fistful of Quarters. This is a film worth watching even if you are not into video games. PPS: Regarding the original concept for Donkey Kong... Nintendo eventually got their license in order and released the game: Popeye in 1982. It is quite enjoyable and has many of the same mechanics in place as the Donkey Kong series.